In a quiet night, in the village, many ghost warriors suddenly emerged in the cemetery, it is quite a sight of crisis, so people have to escape out of the village four surviving. And at this moment, a soldier stood out and he decided to wipe out all these terrorist groups, let's go to help him to fight against the warriors and go through each level.Come on and help a try, it will be absolutely an unforgettable experience for you! You can play Cemetery Guard free online shooting games at fogames. 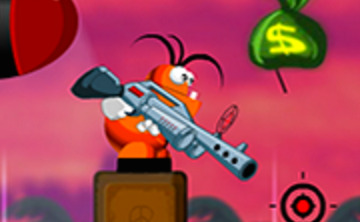 It has tags: Adventure,Action,Shoot Em Up,Blood,Defend,. It has 4729 total plays and has been rated 85.4% (23 like and 5 dislike), find the fun and happy day. If you want to play more shooting games, we find some of the game: Worlds Guard 2, Alien Guard 2, Haunted Cemetery Escape and Royal Guard. To play other games, go to the adventure games page, the action games page, or just check out the new games or best games page.